Basement have announced a UK tour in July. They’ll play nine headline shows with support from Dinosaur Pile Up and The Sun Days, and have appearances at 2000 Trees Festival, X&Y Festival, Truck Festival and Tramlines Festival scheduled in between. The Ipswich band are promoting their latest record, Promise Everything, which they wrote in long-distance writing sessions while guitarist Alex Henery was working in the US. Henery told TeamRock: “It was really hard. The next record we want to focus on being all in the same room. No internet, no distractions, just all of us in one place and just writing. That really excites me. “It was interesting to record like this, but it was stressful because you can’t just stay in the same room – you can’t just jam out ideas. A lot of the writing took place in the studio and in the practices that we had before and leading up to recording. 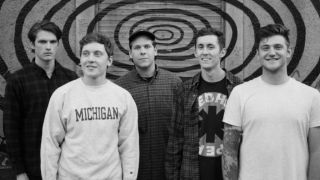 Basement will head to Australia later this month before returning for their UK run this summer.